The electro-hydraulic 4-post lifts of the SM series are available in numerous variants..
All 4-post lifts are equipped with a pneumatically lockable lowering device. Wide tracks allow safe and comfortable driving on from small cars to vans or SUVs without having to change the track width of the track. The cold-formed running surface profile offers high rigidity. Rails Integrated in the running surface allow all commercially available beaming jacks to be accommodated. A wheel alignment kit (AK) with sliding plates is available especially for precise wheel alignment activities. Integrated recesses in the drive-on surface allow all standard rotary tables to be fitted. If no rotary plate is used, the recesses can be closed completely with the included filling parts. 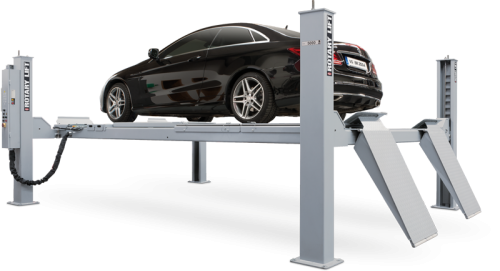 Adjustable ratchet bars in the lifting posts allow an absolutely horizontal alignment of the lift - important for precise work when used as a wheel alignment lift. This guarantees precise wheel alignment and a high degree of workplace safety. Models with jacking beam (LT) have a stepless extension for extending the jacking beam. The up, down and lowering functions on the lowering device can be conveniently controlled via operating keys. Protected from external influences, the maintenance-free lifting cylinder is positioned under the running surface. The quiet powerful hydraulic unit ensures powerful lifting and short lifting and lowering times.